The Union earned this title after tying Cape Express. Bottom Row, left to right: Ava Zohlman, Ava Hanuscin, Daniele DeNittis, Kate Inglis, Rebecca Roberts, Morgan Bielawski and Lindsay Vallila. Top Row, left to right: Assistant coach Brian Kares, Leila Scaramella, Dylan Silar, Libby Hock, assistant coach Andy Vallila, Anna Caprarola, Taylor Kares, Emma Ryan, Sarah Patton and coach Steve DeNittis. Not pictured: Ava Drangula. 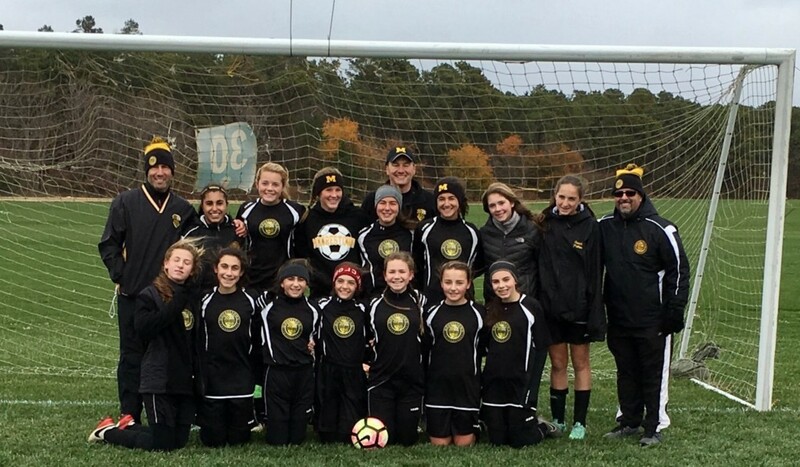 Moorestown Soccer Club’s girl’s U15 team, the Union, won the U15 JAGS Elite Division on Wednesday, Nov. 17 with a tie against the Cape Express Soccer Club of Cape May County. The Union went 9–3–3 for the season. The Jersey Area Girls Soccer League (JAGS) U15 Elite Division is the league’s highest U15-only division. JAGS is a statewide league and is regarded throughout the state as one of the most competitive leagues wherein high-level club teams and mid-range academy teams play.